If you are looking to be a Finance Assistant then any employer will be keen to understand your background and how you are good with numbers and what previous experience you have had in this area. A finance assistant may come from an administrative background and have elements of figures and numbers within that role such as doing invoicing and want to progress further into the finance world. In your personal profile you will need to provide a snapshot of your skills and experiences and help an employer to understand why you would be good for the role that they have advertised. 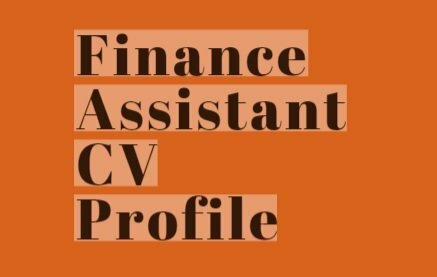 I come from an administrative background but having worked for smaller businesses my roles have always crossed over into doing finance related tasks such as invoices, payroll, petty cash etc and having gained some experience in this area I am now seeking to be a finance assistant and learn all I can about the financial world. I am a very hardworking person who works in a methodical manner. I have had some experience of using Sage but I am keen to learn more and I am happy to do this in my own time. I have had a lot of experience of dealing with customers and feel that I have good communication skills and am happy to call customers and chase payments etc. I have excellent time management skills and have always had to work to strict deadlines with being involved in payroll so understand the importance of meeting deadlines and ensuring that invoices are sent out and also paid on time. I keep very accurate records and have done this both manually and online. I am now keen to work solely in a finance environment and I am keen to learn what I can to improve upon my skills and have a good solid career in the financial world.